Boers-Li New York will be closed from December 25, 2018 (Tuesday) to January 7, 2019 (Monday), open as usual from January 8 (Tuesday) (Tuesday to Saturday, 11 am to 6 pm), "Huang Rui: Zen Space" will last until January 19, 2019. Boers-Li Gallery New York is pleased to present an exhibition of paintings and works on paper by Huang Rui, dating from the 1980s to the present. This will be the first U.S. exhibition of Huang Rui’s most recent series, “Zen Space”. Huang Rui is widely recognized for his foundational role in the development of post-Cultural Revolution art – as a founding member of the audacious Stars Group, for his early application of Western art concepts – abstract expressionism, cubism, fauvism – to Chinese contemporary art, and as a founder and defender of Beijing’s 798 Art District. Huang characterizes his art as “determined, deep exploration”, and “Zen Space”, his latest series, as growing from “…a continuous experimentation towards the most essential statement of art”. This body of work takes shape in part through Huang’s consideration of the Confucian order of society and the Taoist order of nature as they are reflected in the hexagrams of the I Ching (Book of Changes) and in Taoist geomancy expressed through classical architecture and the design of scholar’s gardens. Huang Rui was one of China’s earliest adherents of abstract painting. Abstraction and enduring experimentation with architectural composition, minimalist aesthetics, and the graphic exemplification of philosophical principles are some of the guideposts of his work. 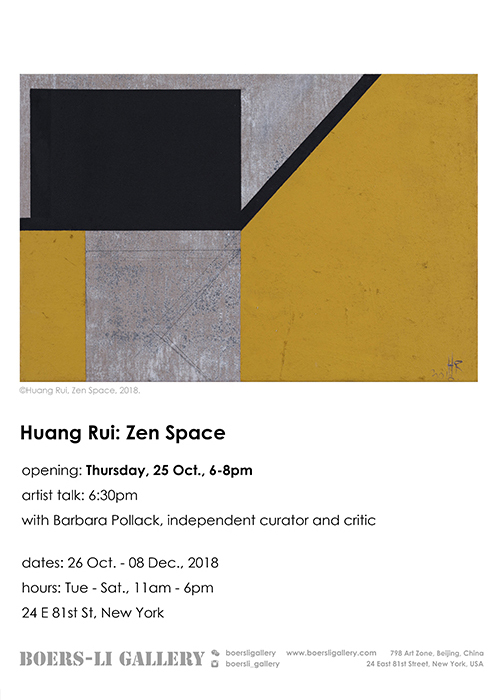 This exhibition includes Stars group paintings from the early 1980s, Huang’s later investigation of spatial elements inspired by Chinese traditional architecture, and works from “Zen Space”, a summation to date of his ongoing exploration to embody Asian philosophies in his art. Huang says, “In ‘Zen Space’, the material is not real matter, but an essential state of mind….”. Born in 1952, Huang Rui was an influential force among the Chinese avant-garde. Along with artists Wang Keping, Ai Weiwei, Ma Desheng and Li Shuang he founded the Stars group which was active from 1979 to 1983. The Stars were the first publically active art collective to protest government censorship after the Cultural Revolution, and, in their divergence from State-sanctioned Socialist realism, flaunted a pointed means of artistic and political expression. In 1982, Huang Rui travelled across Eastern China to Jiangsu and Zhejiang Provinces where he discovered a resonance between the classically designed gardens and waterways and his developing exploration of abstraction. The highly prescribed use of space in a scholar’s garden is an iteration of Taoist cosmology meant to represent the underlying principles of physical reality. Although Huang says, “I have never had faith in anything other than art, and neither have I worshipped idols of any domain”, Taoist and Zen concepts concerning the earthly representation of essential truths imbue his work. In 1984, Huang Rui moved to Japan. He went there, he says, “to realize art” while “transcending art”. Japan’s less restrictive atmosphere and Huang’s reaction to what came to be called the Mono-ha group of artists provided an opening for this new stage. The Mono-ha artists rejected many of the tenets of abstract expressionism, stressing the “thingness” and the placement of the work. Huang’s own work, perhaps “post-Mono-ha”, became freer and more expressive; a distilled integration of color, space and energy. In Japan, Huang was also exposed to the injunctions of Zen practice to depict the essence of nature without being misled by logical thought. Taoism, Zen, and the opposing yet complementary flow of yin and yang infuse Huang’s latest work. The “Zen Space” pieces summon reflection on change, duality, wholeness and what it is that allows things to be. Huang Rui has participated in various international exhibitions, including the Venice Biennale, the Rencontres d’Arles Photography Festival, and his works have been featured in prominent venues such as the Groninger Museum, Netherlands; Cobra Museum, Amsterdam; the China Institute, New York; He Xiangning Art Museum, Shenzhen; and the Guangzhou Museum. 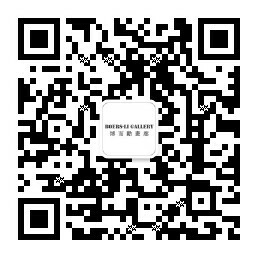 His works are in the collections of the Solomon R. Guggenheim Museum in New York; M+ in West Kowloon; and in other public and private collections worldwide.